Irrigation is one of those crop practices that was really near and dear to people’s hearts last year since so much of the U.S. had a drought last year. I know here in St. Louis we all longed for rain and in the meantime, I was glad I had a timer on my soaker hose so my tomato plants in my raised beds would stay productive. 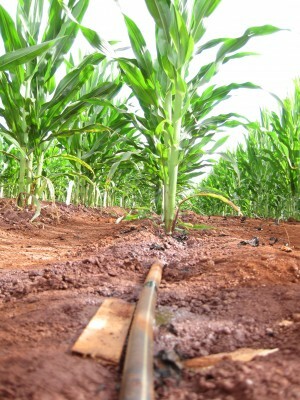 It has some similarities to irrigation on the farm, but there can be some big differences too. 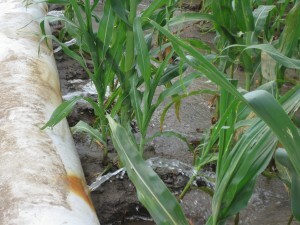 So, what have I learned about irrigation and on farm water use? Enough to know I don’t know nearly as much as the farmers I know but I know a bit more than my sisters (neither of them are in ag 🙂 ). There are lots of areas of the U.S. that are largely rain-fed — of course some of those places are desert dry so rain-fed seems a misnomer but if there is no rain in an area, it is also hard to irrigate without a water source nearby. In short, it depends on what water is available as to what gets watered. However, the priority tends to go with the higher income-producing crops as irrigation can really add to the cost of production. 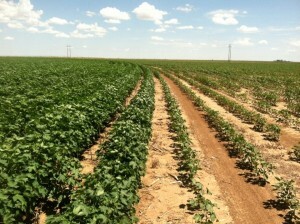 Fruits and vegetables in areas where rain is not consistent tend to be irrigated as do some of the major row crops. I’ve lived in and traveled the gamut of irrigation zones it feels like. The Plains of Oklahoma was probably the driest place I’ve lived and my friend Becky McCray can attest to that. There is an ability to put in wells there, but the wells tend to be deeper and water is limited. Whereas my years in the Mississippi Delta, there were months of the rainy season and the soil profile always seemed to have water just a bit below the surface. Even then, putting in wells and running them can be expensive and, consequently, there are a lot of rain-fed fields. Farmers view irrigation as an investment against the risk of drought so if you drive through the countryside where water is readily available in a winter following a really good harvest, you will usually see a few wells going in. I have also talked to some farmers in the Delta recently who were adding pipe & gates to capture rainwater for irrigation. What’s amazing to me is how precisely farmers measure how much water they are putting out on a field! I have to admit to winging it at my house. There are a bunch of different types of irrigation. The ones I know best are flood, center pivot and drip. So I’ll walk through those. In the past, flood irrigation was probably the most common. That’s when pipe is put down, running along the ground from the well through the field and water pours out much like when I turn a hose on and just let it run for a given amount of time (which I did a few times last year trying to keep the trees in my yard alive, dang it was dry!) This tends to only be used where there is an abundance of fresh water and it seems more and more farmers are moving away from it. Center pivots are the kind of irrigation that really makes people wonder what’s happening. In fact, lots of people flying over the High Plains or the far west wonder about all the crop circles they see from the air, it is where center pivots are running! I also think they look a little bit like spokes or spiders going across the field (even made a video post about that for work). Center pivots have been modified in recent years so the water comes out closer to the crop as farmers look to reduce evaporation. The most effective conservation method of irrigation I’ve seen farmers adopt is a kind of irrigation you rarely even see! The photo at right shows how the irrigation tape or pipe is laid right along where the seeds are planted or the crop grows. The pipe is left exposed at the end of rows so its clear where it is running. The cool thing is that although this takes more time, expense and effort on the front end, it is a great way to avoid water waste. I know more and more farmers who have moved to this as they updated or invested in irrigation. It’s like my soaker hose except I have to admit I leave min on top of the ground. This is one of the ways farmers are trying to get more crop per drop! Thursday will be brought to you by the letter “J” so I’m giving thought to what the word of the day will be! 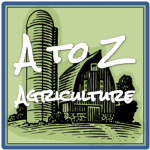 Check out the other posts in this series by clicking on the logo at left, reviewing the letters below, or by browsing the A to Z ag tag archives. You should also feel free to add ideas for upcoming letters! How we would love some of this wonderful thing called irrigation! Out here next to the Chihuahuan Desert, we can only depend on Mother Nature to irrigate our cotton. I know you would! I called it rain-fed if not irrigated but I know you are seriously dryland. J…for juggling? Farmers many times beyond having their 24 hr job of growing food and fiber, also volunteer as firefighters/emts, school board members, and for commission groups. We are farm bureau members and fight for what we believe in at the legislature. We also work to keep our crops alive, our families and soil healthy, and herds strong. Never in my life, until I started farming, did I realize how much of a juggling act “just a job” could be!! Nice! Where is/was his farm? I’m no irrigation expert because we have none on our farm. We are usually in the business of trying to get rid of or waiting for water to go away. But I do know irrigation gets the same high tech precision ag treatment my tractors and implements have. Farmers are controlling their water via their smartphones and using GPS based prescriptions to regulate rates of water and whatever else they may add to the mix so that each part of a field gets just what it needs vs a blanket rate across an entire field. Go tech!